Dillian Whyte is starting to have his doubts regarding the scenario of facing Anthony Joshua in a rematch on April 13 at Wembley Stadium in London. On December 22, Joshua was ringside at The O2, as he watched Whyte’s sensational knockout of Dereck Chisora in the eleventh round. Afterwards, Joshua and Whyte traded heated words and the rematch appeared to be on schedule. Whyte has been gunning for a second crack at Joshua since their initial clash in December 2015 – which Joshua won by knockout in the seventh round. A second fight would have far more at stake, as Joshua now holds the WBO, WBA, IBF, IBO heavyweight titles. While their mutual promoter, Eddie Hearn, has openly stated that a Joshua-Whyte encounter was the likely option – Whyte has yet to discuss the contest with Hearn himself. “I have no idea [if I’m fighting Joshua]. I don’t know what’s going on. I expected him and his team to have at least contacted me,” Whyte told IFL TV. 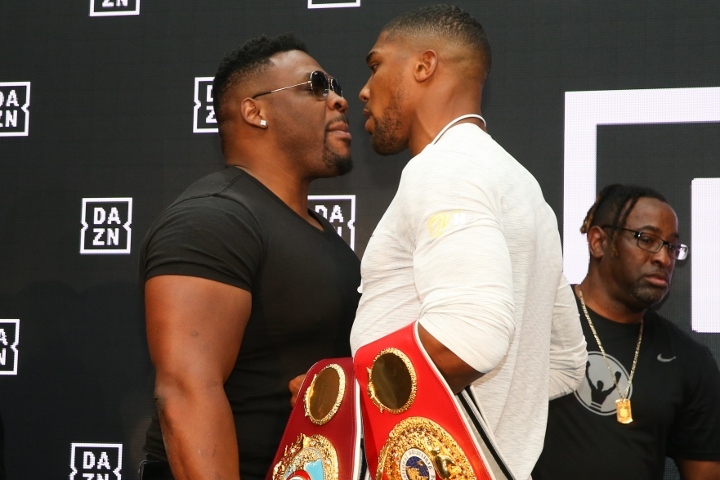 A few weeks ago, BoxingScene.com revealed the strong industry chatter that Joshua could potentially take a pass on fighting Whyte in London – and instead face Jarrell Miller on a later date at Madison Square Garden in New York City. Whyte has heard the same talk. “Rumour has it that Joshua’s gonna fight Miller in Madison Square Garden, so let’s see. It’s a small world and a lot of things you hear in boxing there’s usually a massive amount of truth to it,” Whyte said.